Ever since I first made black bean brownies, it’s my go-to dessert. White bean blondies come in a close second place, but really, my heart belongs to the original. Now that it’s fall though, my go-to dessert recipe got a slight make-over. 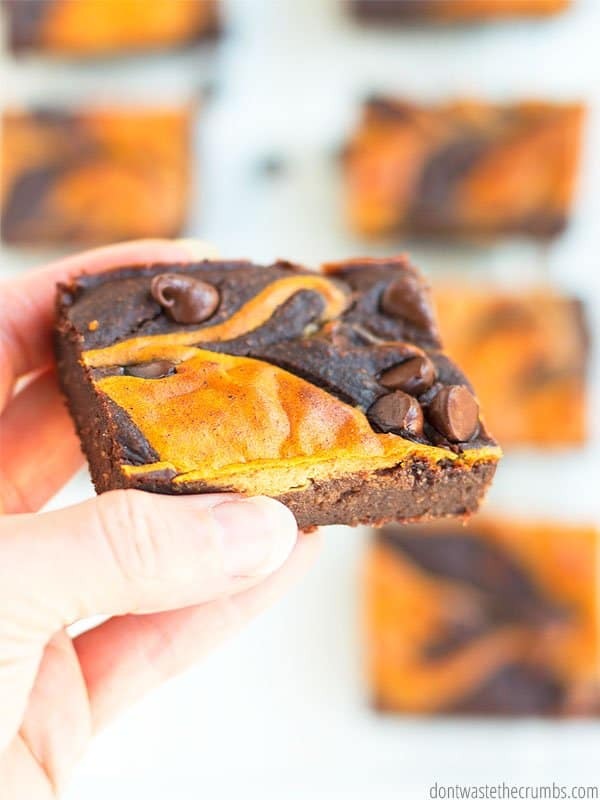 Move over black bean brownies, hello PUMPKIN SWIRL black bean brownies!! Just take a look at that gorgeousness – isn’t it beautiful? 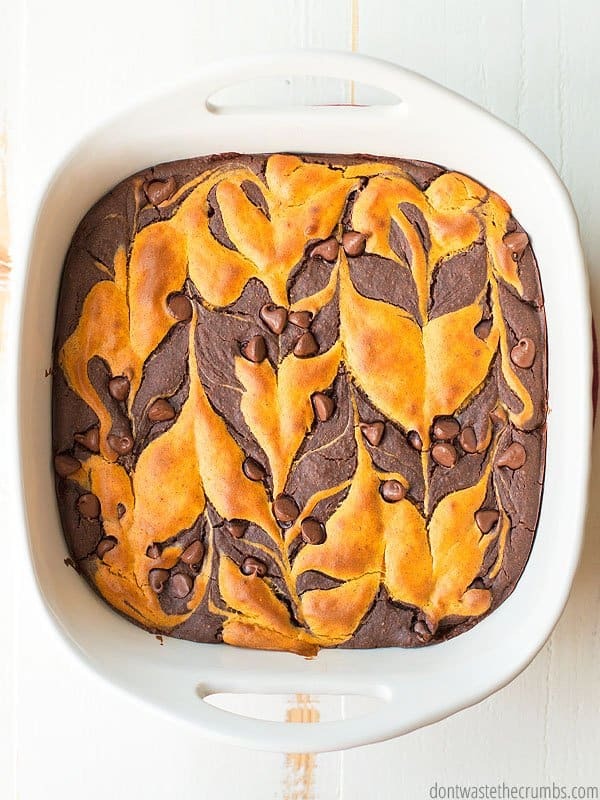 Ok, let’s pause this drool session for a moment and let’s discuss all things awesome about this pumpkin swirl black bean brownie recipe. 1. The ingredients are in your pantry. Oats, black beans (either canned or homemade from scratch – either will work), maple syrup, eggs, cocoa, coconut oil, chocolate chips… you know – essentials. And since it is fall, I’m guessing you have pumpkin puree and pumpkin pie spice on hand too. If not, add both to your list ASAP (or make them yourself, homemade pumpkin puree and homemade pumpkin pie spice, respectively) – along with cream cheese – and put this dessert on the menu. PS – Not sure what to do with the other 4 oz cream cheese? I suggest stove-top mac and cheese or fetuccine with creamy vodka sauce. If you’re in the mood for sweets, make a half batch of pumpkin cookies with naturally sweetened cream cheese frosting! If you don’t know what to do with the rest of the pumpkin, here are all my favorite pumpkin recipes. 2. You can make it in a blender. Guys, nothing screams easy more than a recipe you make entirely with a blender. There’s no chopping, stirring or anything like that. You have two rounds of “dump and blend,” a quick swipe with a butter knife (to make the swirl), a good long bake and BOOM. Pumpkin swirl black bean brownies are on the table. I recommend whipping up this recipe as you’re cooking dinner. You know those minutes you have when you’re stirring something, waiting for water to boil or something else is in the oven? Those are the minutes I’m talking about (and the minutes I help you make the most of in my free mini-course Real Food Fast!). Whip up the black bean brownie part first, and pour into the pan. 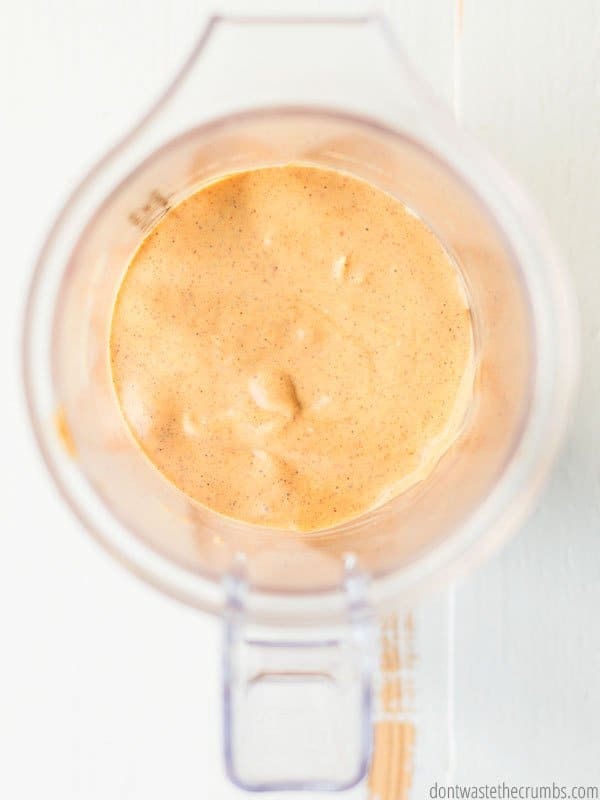 Then blend the pumpkin swirl batter and let it sit in the blender until you’re ready to bake. Before you sit for dinner, swirl the batter and stick the pan in the oven. 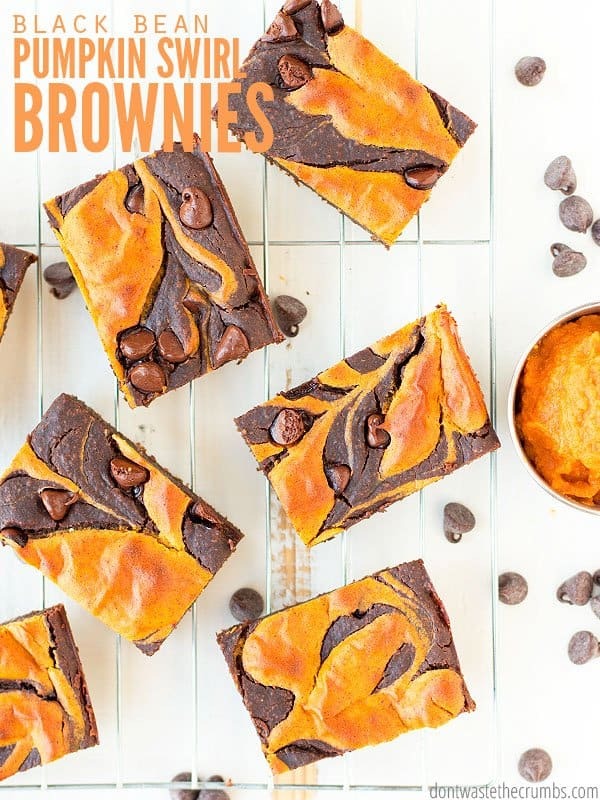 Your delicious batch of pumpkin swirl black bean brownies can bake while you’re eating dinner, cool while you’re cleaning up and everyone still goes to bed on time. My original black bean brownie recipe is made in either an 8” x 8” baking pan, or a 9” x 9” baking pan (whichever you have will work). And I took pictures in a smaller pan ONLY because my big pan was dirty. So don’t be fooled. I haven’t mastered the art of splitting one egg into two, meaning this recipe makes a full pan of brownies. Not a bad side effect if you love brownies and pumpkin like I do! Whether you make this for company, freeze half for later or eat half the pan when no one is looking (I won’t judge! ), this family-size recipe has you covered. 4. This recipe is 100% company friendly AND healthy. I mentioned earlier that this is my go-to dessert recipe, and that includes when we’re hosting company. In fact, I gave my original black bean brownie recipe to company and THREE PEOPLE didn’t even realize it was made with black beans. That means this season when you’re asked to bring a dish to a party, sign up for pumpkin swirl brownies. You’ll win them over AND feel good knowing you brought something healthy! Oh yeah, by the way, these brownies are slightly gooey and fudgy. I almost didn’t say anything, because in my mind ALL brownies MUST be gooey and fudgy. There simply isn’t any other way to make them! But I do have one, single, lonesome friend likes to rebel and prefers cake-like brownies. She’s the one who prefers edges because they’re the most cooked. 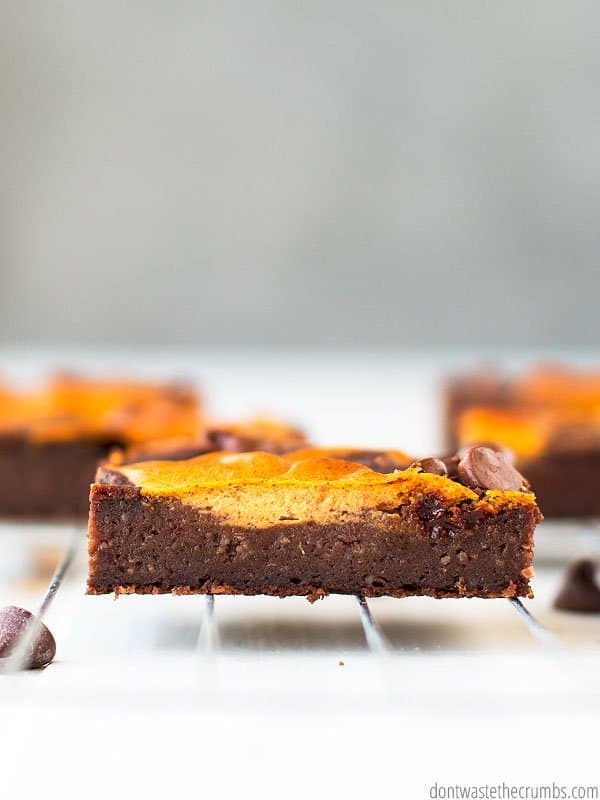 She’s also the one whose piece I would steal because these brownies are AMAZING just the way they are – slightly gooey and fudgy and filled with everything good that chocolate and pumpkin can offer. So heads up if you’re in camp cake-like brownies – I’ll eat your pieces. Did I mention that these pumpkin swirl brownies disappeared in minutes? My husband ruined his dinner with them on more than one night. The kids asked for them in their lunches AND after school snack. PPS – Don’t forget to stock up on pumpkin while you can! Grease a 9" x 13" glass baking dish with butter and set aside. In a blender, combine all the brownie base ingredients except the chocolate chips. Blend until the batter is smooth. Pour into the prepared pan. Sprinkle chocolate chips evenly over the top. Wash, rinse and dry the blender. 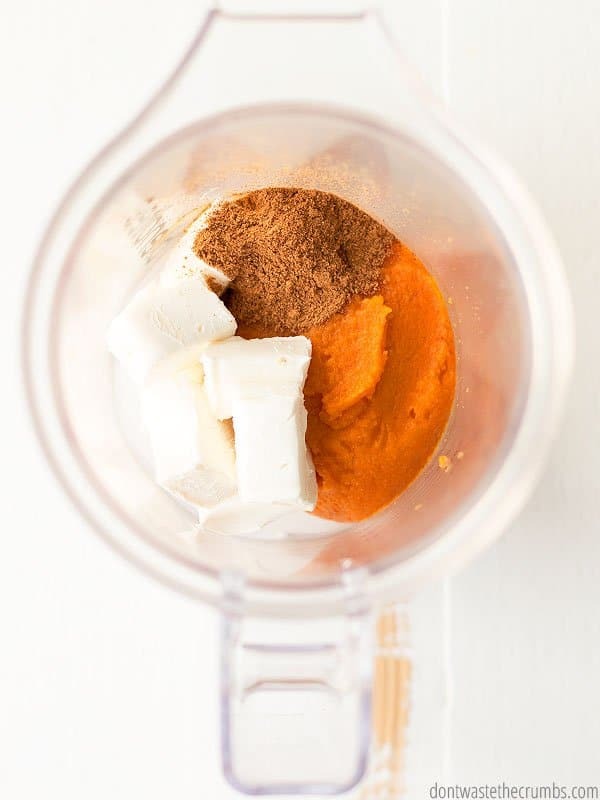 Add all the pumpkin swirl ingredients and blend until they batter is smooth. 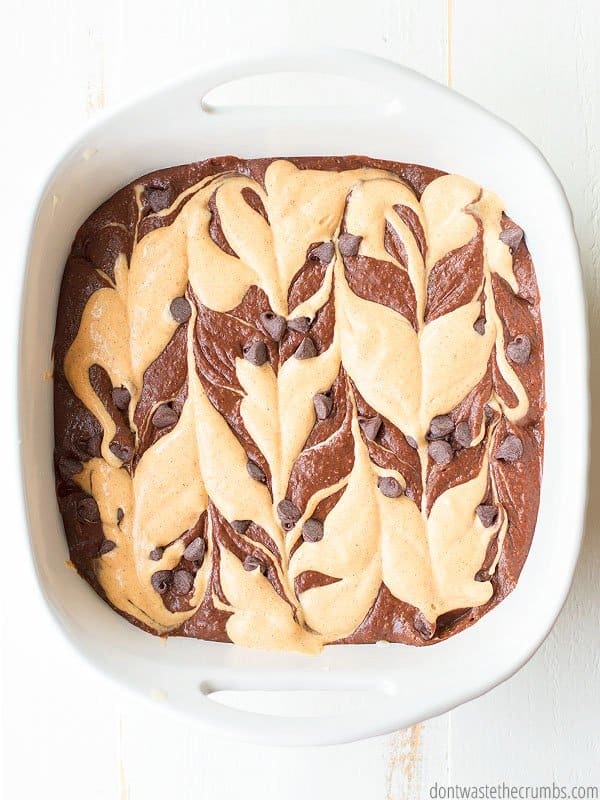 Using a large spoon, dollop the pumpkin swirl batter on top of the brownie base. Using a butter knife and starting on one side of the pan, run the knife through the batter and all the way down the pan. Move over about 1 inch and repeat the process, this time running the knife in the opposite direction to get the "back and forth" swirls. Repeat until the whole pan has swirls. Bake for 40 minutes, or until the edges of the brownie start to pull away from the edge of the pan. The brownie will be gooey and fudgey. For a firmer brownie, store in the fridge. * Since my family has diligently reduced our sugar intake, it doesn't take much sweetener for us to taste it. 1 cup of maple syrup is not a lot for an entire pan of brownies, so I encourage you to taste the batter and adjust to your liking. How do you like your brownies – cakey? Or fudgey? And more importantly, are you the type of person that mixes pumpkin with chocolate? 1/2 a what of pumpkin puree? Looks great! Cup! I’ll fix that right now! Anything that would compliment cream cheese and chocolate would work, maybe strawberry or raspberry puree? You’d have to tinker with the measurement though, since it may not have the same consistency as pumpkin. Have you ever made these with honey instead of maple syrup? Thanks much! I usually have a lot more honey in the house than maple syrup! I made this last night and it was just awful! Ended up throwing it all away! Really Terri? Did you follow the recipe as written? Can you be more specific as to why you thought it was awful? We made several batches for several families and everyone like them. OK, these were super yummy! I like that the brownies needed no eggs. I have made black bean brownies with 4 eggs before. I had a half cup of pumpkin puree left from another cooking adventure so I decided to finish it off with this. Thanks!! Hi. Have you ever tried a different flour. A family member cannot eat oat flour. I am new to using different flours and haven’t experimented enough to be comfortable swapping out the flour. Thank you. Are they allergic to oats, Michele? If not, you can just include the same measurement of oats to make oat flour (some store-bought flour have additives). If they are, all-purpose should be a fine alternative. I haven’t tested whole wheat, but white wheat should be okay too (it’s less “wheaty” than red wheat). Fantastic recipe Tiffany! They were amazing. My kids didn’t even know the brownies were “bean” brownies!! I’m so glad you liked them Mary Katherine!! Can you swap the coconut oil for butter or something else? Our friend is allergic. Will brown rice syrup work? I don’t have any maple. In theory it should Amy, but give a taste test first. I haven’t used either one of those sweeteners, and I’m not sure how sweet they are in comparison to maple syrup. Both batters should be thick! I successfully made a half batch! This was only due to having teenage chickens that are laying tiny eggs where I need two to equal one anyways. 😂. I subbed the chocolate chips for pecans so I didn’t need to make a store run for one ingredient. They are in the oven now and looking amazing. It makes me feel good that I’m feeding my family something healthy-ish and sweet! Amazing. This recipe is good for the entire year (not just pumpkin time). Thanks!!! quick ? on step #4, do I have to wash the blender between the brownie batter and the pumpkin swirl topping? If I scrap the blender well…good enough? or will the batter not be as pretty as your photo? I’m going to go rinse & soak the beans so, I can make them in the Instant Pot in the morning. Then try this recipe tomorrow…hope to sneak this into the oven without the children noticing 🙂 what is in the brownies. You don’t HAVE to Priscilla, and I only washed to help the color contrast in the pictures. 😉 I think a good scraping is just as good!! I didn’t tell my hubby what is in it and he enjoyed it. I had to come back and update my reply- after I put them in the fridge to firm up and cool, I could not detect the beans AT ALL! Have you ever tried to make a Blondie version with navy beans? At first, I was not too sure of the pumpkin and chocolate combo, but the more I ate, the more I liked it. Hi Tiffany! These brownies are so delicious! I’ve made them several times and they have become a family favorite. We had them again this morning for breakfast. Thanks for all you do Tiffany! Your work on your blog is amazing. Keep up the good work! Can you make this without cream cheese?? My dad can’t have dairy. I haven’t made this without the cream cheese Megan, so I’m not sure. There are recipes out there for a dairy-free cream cheese that use cashews! These taste great but how gooey is too gooey? My oven temp is usually true to what recipes asks but these barely hold their shape when cut. Are they underdone? Hi KS! Did you let them cool completely before cutting? They should hold shape when they’re cut, but this won’t happen fresh out of the oven. And they hold even better once they’ve been in the fridge. If you let them cooled, I’d say they’re underdone (but honestly, I’d still eat them, LOL). any adjustments to baking for high altitude? I’m so sorry Sue, I’m not experienced with high altitude baking so I don’t know!